10 for groomed surface carving, 4 for off-piste. Superbly fun, adjustable-flex frontside carving machine suitable for low-level intermediates looking to achieve secure carving skills through hyper-carving race-oriented experts looking for thrills on-edge at all speeds. The ability to adjust the UFOria XA from soft and compliant short-radius turns to sincerely grippy, securely strong and exciting large-radius turns under GS pressures is simply a hoot and very impressive. There is nothing like it on snow. Balky and unhappy in deep snow, but surprisingly fun and responsive in the bumps when the flex is adjusted to your style. 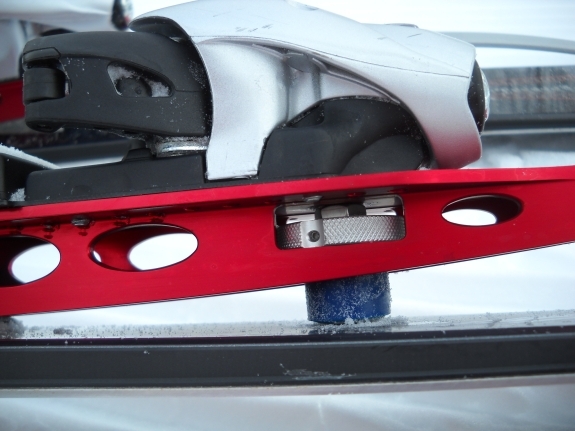 Very expensive, but can provide the behavior of several different skis in one package of highest quality. More versatile in different frontside conditions than the firm-surface-only Carbon EX, but not as quick edge-to-edge. The XA rewards a strong skier. 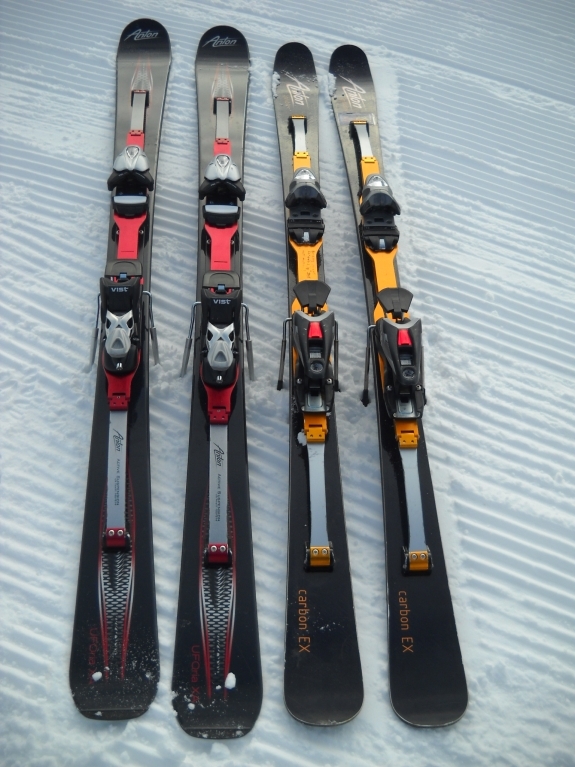 The UFOria series is the second-generation release of the Anton Dynamics (formerly Anton Gliders) suspension ski system. The UFOria series is available in a mid-performance, non-adjustable flex "UFOria -S" model and the premium "UFOria -XA" model with adjustable flex and more aggressive suspension geometry. We previously tested the first-release generation of Anton suspension skis (click here for previous review and photos) and found we liked the widest, high-performance Carbon-EX model best. 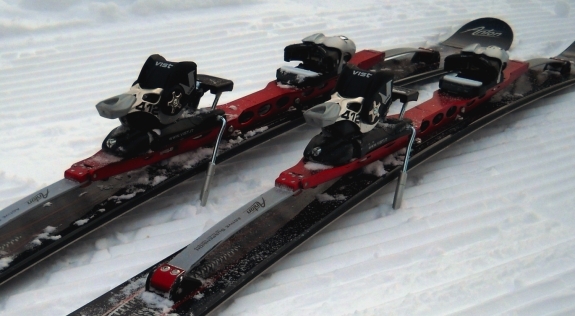 Anton Wilson designed an even wider, longer ski than the first series and fitted a revised suspension system to it, resulting in the UFOria series, which has won over many skiers of all abilities. We tested the top-of-the-line UFOria XA model here. Wood-core, fiberglass, carbon-base, full-wrap edge ski construction with adjustable, aluminum suspension system. VIST lite series bindings included. Superb-quality ski construction and finish. Aluminum suspension system is a work of art with impressive fit and finish of components. New wider ski is well proportioned and responds to hand flexing (on all settings) throughout its length, visibly distributing pressure effectively to the ski's forebody, midsection and tail. Damp feel and impressively torsional rigidity. The gloss-black color is a nice looking platform for the red aluminum spaceframe and silver spring elements, but the "zipper" pattern graphic doesn't do much for me. Powder (shin deep), cut-up powder, packed powder and hardpack surfaces, very cold, dry snow. 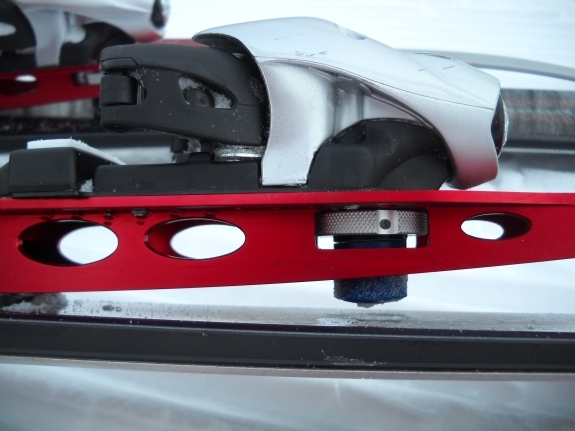 adjust the ski's flex and turn radius characteristics by turning two knurled screws (with gloves on). The UFOria XA also allows relocation of the binding on the platform (with a #3 Pozi driver) so you can get your own mounting position dialed-in to where you like it. When people see the Anton UFOria, they often ask.."does it feel springy or bouncy?" The suspension system doesn't give that impression at all. The ski is damp and controlled, never nervous or jumpy, but responds instantly to weighting, angle and rotational changes, always feeling well-planted and follows the surface of the terrain. I found the Anton UFOria XA to provide remarkably detailed feedback about the snow underfoot, even with the suspension system and aluminum frame between the boot and snow surface. You would think it would isolate feedback to your feet, but it communicates the degree of pressure, resistance, friction and depth better than most skis capable of high-intensity carving or slow and easy cruising. It works, and it's really fun to ride. A slot car you can ride in, and adjust. I would experiment with a bamboo core to reduce some weight. 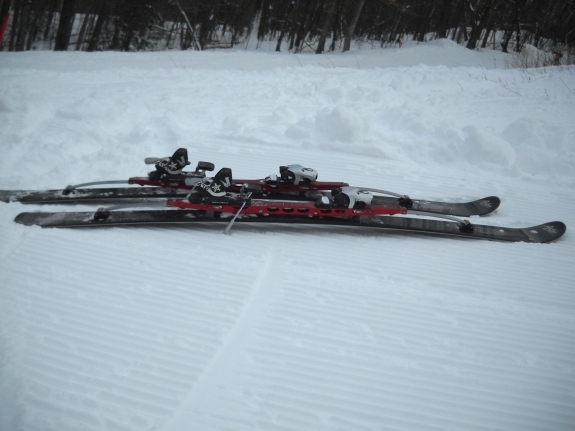 with short radius turns, or stiffen it up to make GS turns like a race ski. Remarkable and one of the most interesting skis I've tried. Not for powder skiing, but ideal for all kinds of groomed surfaces. 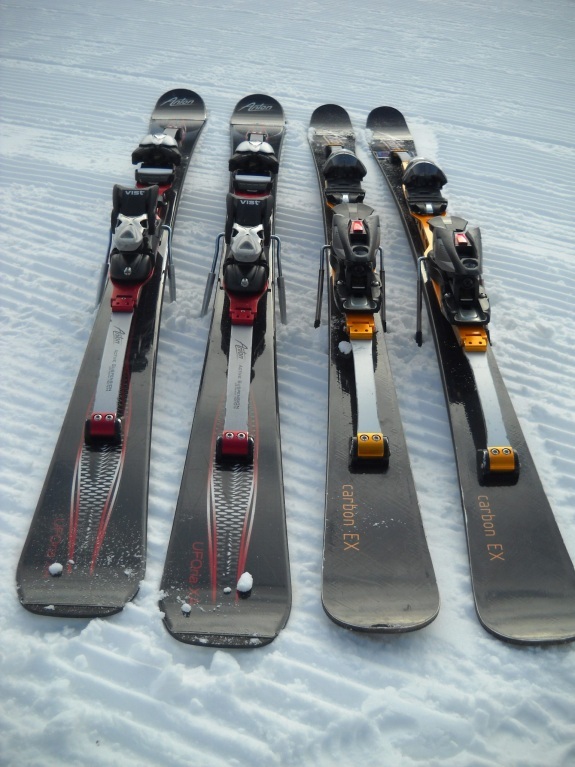 All ski makers should try them and study the principles used to get it to perform the way it does." Try a pair before you judge them by looks alone. 5' 11", 180 lbs. Expert groomed-surface carver, "old-style" race inspired, "foot steerer" with fairly sensitive edging feel. 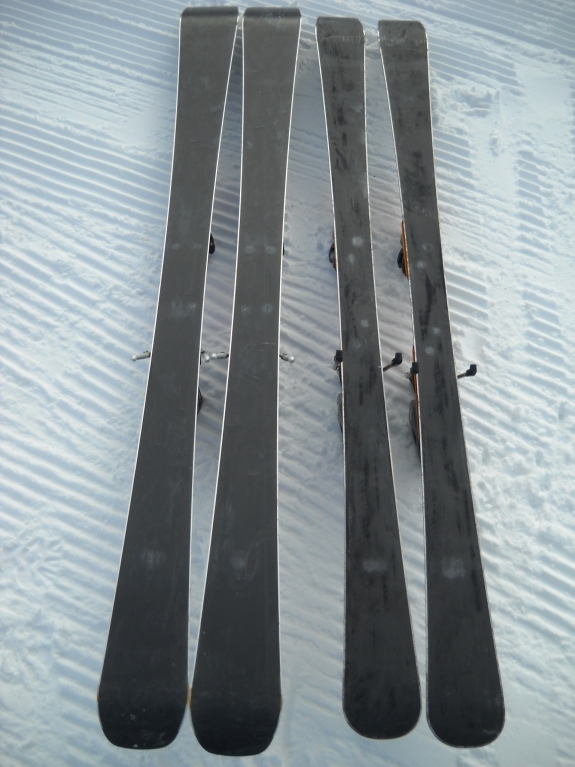 Loves to hold long arcs with lots of pressure on the downhill ski (you know the type), but also loves the feel of both skis on-edge leaving tiny railroad track edge tracks. Loves powder when it's not tracked out. 10 year coach for youth race team in New England (bulletproof is the norm).